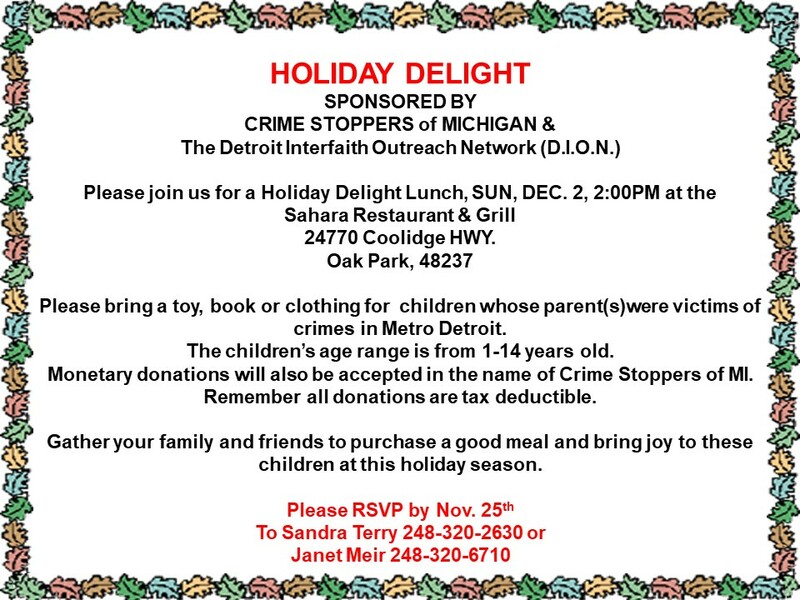 Please see the attached invitation to our Holiday Delight - a chance to go out to lunch and bring a gift for a child who lost their parent(s) as a result of crime in Metro Detroit. Thanks and hope to see you and your friends, family , and congregants there! As you go about shopping this week, please think about buying a book, toy, or article of clothing for these kids - ages 1- 13. You can bring it to the luncheon - and if you can't come to that for some reason, then drop it off at 10075 Nadine, Huntington Woods - and Dorit will see that it gets to CrimeStoppers before Dec. 16.